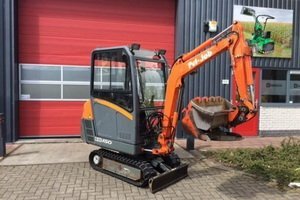 1006010 EB12.4, EB14.4 & EB16.4 PEL-JOB EB12.4, EB14.4 & EB16.4 Mini-excavator Technical data. Free Download. 1006020 EB150 & EB200 PEL-JOB EB150 & EB200 Mini-excavator Technical data. Free Download. 1006021 EB150XR PEL-JOB EB150XR Mini-excavator Spare parts Catalog. English Language. 1006022 EB150XR PEL-JOB EB150XR Mini-excavator Spare parts Catalog. German language. 1006023 EB150XR PEL-JOB EB150XR Mini-excavator Spare parts Catalog. French language. 1006030 EB16.4 PEL-JOB EB16.4 Mini-excavator Spare parts Catalog. English Language. 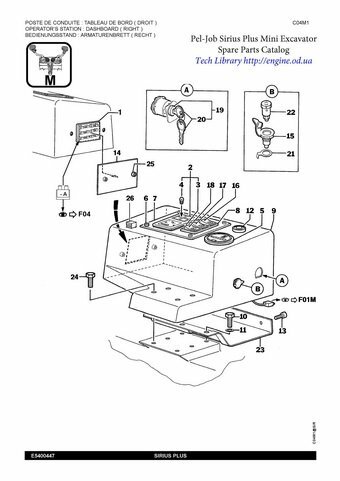 1006031 EB16.4 PEL-JOB EB16.4 Mini-excavator Spare parts Catalog. German language. 1006032 EB16.4 PEL-JOB EB16.4 Mini-excavator Spare parts Catalog. French language. 1006033 EB22.4 PEL-JOB EB22.4 Mini-excavator User's guide. French language. 1006040 EB25.4 PEL-JOB EB25.4 Mini-excavator Technical data. Free Download. 1006050 EB250 PEL-JOB EB250 Mini-excavator Technical data. Free Download. 1006060 EB30.4 PEL-JOB EB30.4 Mini-excavator Technical data. Free Download. 1006070 EB300 PEL-JOB EB300 Mini-excavator Technical data. Free Download. 1006080 EB306 PEL-JOB EB306 Mini-excavator Technical data. Free Download. 1006090 EB406 PEL-JOB EB406 Mini-excavator Technical data. Free Download. 1006100 EB450 PEL-JOB EB450 Mini-excavator Technical data. Free Download. 1006110 EB506 PEL-JOB EB506 Mini-excavator Technical data. Free Download. 1006120 EB506P PEL-JOB EB506P Mini-excavator Spare parts Catalog. English Language. 1006121 EB506P PEL-JOB EB506P Mini-excavator Spare parts Catalog. German language. 1006122 EB506P PEL-JOB EB506P Mini-excavator Spare parts Catalog. French language. 1006130 EB706 PEL-JOB EB706 Mini-excavator Technical data. Free Download. 1006131 EB706C PEL-JOB EB706C Mini-excavator Spare parts Catalog. English Language. 1006132 EB706C PEL-JOB EB706C Mini-excavator Spare parts Catalog. German language. 1006133 EB706C PEL-JOB EB706C Mini-excavator Spare parts Catalog. French language. 1006140 Sirius Plus PEL-JOB Sirius Plus Mini-excavator Technical data. English Language. 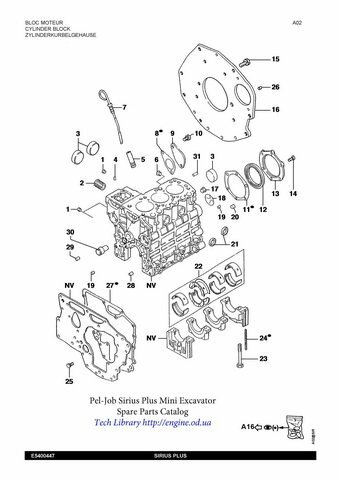 1006141 Sirius Plus PEL-JOB Sirius Plus Mini-excavator Spare parts Catalog. English Language. 1006142 Sirius Plus PEL-JOB Sirius Plus Mini-excavator Spare parts Catalog. German language. 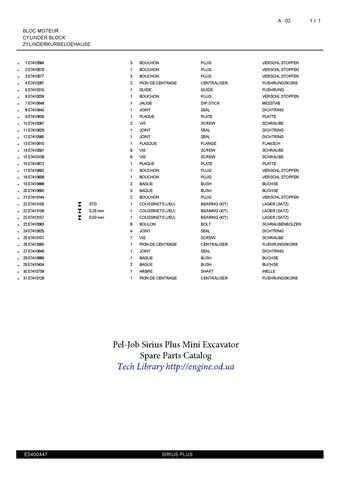 1006143 Sirius Plus PEL-JOB Sirius Plus Mini-excavator Spare parts Catalog. French language. 1006144 Sirius Plus PEL-JOB Sirius Plus Mini-excavator Technical data. Free Download. 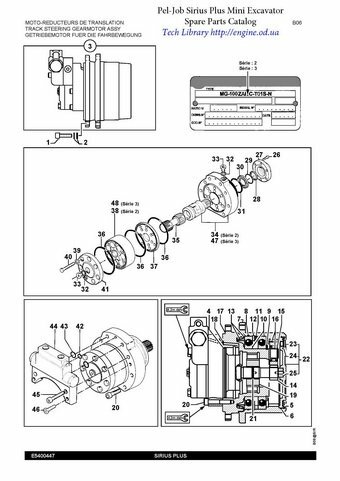 Pel-Job Spare parts catalog - Sample pages.